April 5th, 2009: It was -5°C this morning, but bright and sunny. Yesterday started out foggy, then sunny, then heavily overcast, then sunny again. For awhile, it looked as if it could rain, but it didn’t. A good rain wouldn’t be out of place about now, to clean things up and get rid of more snow. It has been a very slow, steady melt; temperatures prevent a fast thaw but even when it’s below freezing the sun takes the snow down a little more. I haven’t heard of any drainage problems at all. At the very worst, I can’t see us having a problem where we live; we are quite high above Berini and the ground slopes away in all directions. The sidewalks are clear of ice and snow, but there are a lot of places where snow on the lawns thaws and runs across the sidewalk; when the temperature falls at night, it freezes and becomes very slippery. It’s just about possible to walk for coffee without getting splashed, but only in the afternoon when the ice has melted. We are paid up at the Field House for April, but after that will do our walking around here. Too bad we haven’t got a rowing machine – we are both finding that excellent exercise. We went to a farewell party for Ev and Bryan Bjarnason on Wednesday. They are in the process of selling their house in Saskatoon and moving to Red Deer, where they have family. There must have been thirty or more at the party, which was at Mulberry’s in Market Mall. Most of them were coffee row regulars and their wives, but there were several people I didn’t know. It was a lovely party, very informal. We had cake and coffee; Neil Matheson made a short speech, and Thordy Kolbenson made a fun presentation – another trophy for Bryan to find a place for; something to do with the Montreal hockey team. After that we mingled and visited. We hadn’t met Ev before, but were able to have a nice conversation with her – it turns out she is a faithful reader of this column in the Foam Lake Review. Ev and Bryan are very popular people, respected by all who know them. They will be sorely missed in Saskatoon. I e-mailed her back to say that I would get the girls to do it before they left; haven’t heard from them since. 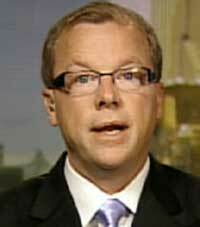 I think Brad Wall (right, image from CTV) is doing a tremendous job as Saskatchewan’s ambassador, gaining respect from all over the continent. But what do you think of his new glasses? To me, it looks as if his head is in a vise. I had surgery on my eyelids because the skin was drooping down and interfering with my lateral vision; the latest in eyeglass styles seems to be a very heavy sidearm that looks as if it would cut off lateral vision completely. Isn’t that a bit dangerous for a driver? Woodworkers among you would find an upcoming display interesting. The Saskatchewan Woodworkers Guild is putting on a display of their work during the week of May 30th to June 6th at the Galleria Building, off Preston on Innovation Boulevard. We went to it last year and were fascinated. Wood turning, carving, constructions, anything to do with wood that you could think of. It’s free, too. It’s open from 11:00 am to 9:00 pm every day except the last day, when it closes at 4:00 pm. Looks like our provincial parks are getting a financial shot in the arm from the government. I will try to contact someone from Greenwater to find out what they are doing, but the rumour is that the bridge to the marina (top of page) will be replaced. It’s pretty old and has to handle a lot of traffic, much of it heavy. It periodically develops huge holes, and now is restricted to one-way traffic. 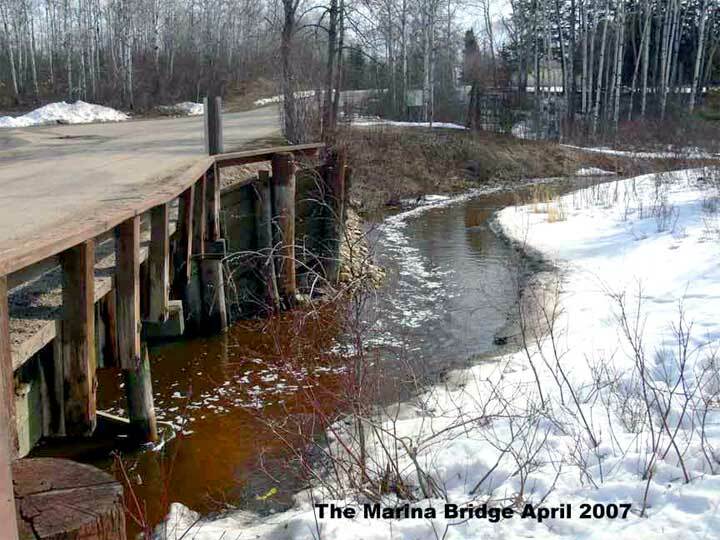 Since everything for the campgrounds or the Marina has to cross that bridge, it’s time it was replaced.